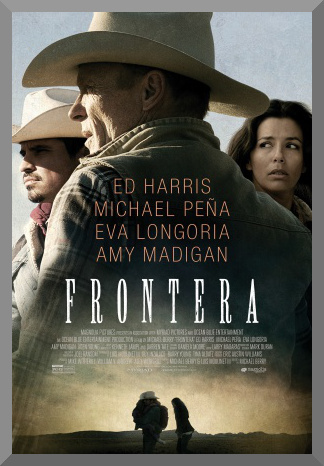 Frontera is an example of a movie that is, for lack of a better term, aggressively OK. The acting is good, it’s shot well, and there’s nothing egregiously wrong. But the 103 minute movie suffers from too many plotlines thrown together, the need to wrap everything up in a bow, and a general feeling of disconnect, making it a film that has the feel of something important, but none of the impact. Certainly the cast, led by the likes of Michael Peña, Ed Harris, and Eva Longoria, are not to blame, as they deliver convincing and interesting performances. Perhaps some of the problems may lie with the director and co-writer, Michael Berry. As a directorial debut, it certainly could have been worse, and he handles it with a degree of prestige, but with its timely subject manner and multipart plot, this could have turned out to be something a lot better, as well. Miguel (Michael Peña) and Jose (Michael Ray Escamilla) are two Mexican men that illegally cross the border into Arizona. While talking to Olivia (Amy Madigan), the wife of former sheriff Roy (Ed Harris), in the desert, asking about where to find work, the two men are shot at by three high school students on a cliff above with a rifle owned by the father of one of the boys. While the guys claim amongst themselves that they’re not trying to kill anyone, and that they’re just scaring the men back into Mexico, a shot spooks Olivia’s horse, throwing her off. She hits her head on the rocks below, and dies in her husband’s arms, who arrives shortly after the initial shots echo throughout the canyon, audible from the couple’s nearby ranch. With Jose fleeing the scene and the actual shooters long gone, driving away in a startled panic, Miguel is the only person visible in the vicinity, and he is arrested to be tried for the crime. Meanwhile, Miguel’s pregnant wife Paulina (Eva Longoria) must make an impromptu cross into the United States herself after hearing of her husband’s arrest, but the group she travels with is abducted by coyotes (human smugglers that operate on the Mexican-U.S. border). So by reading this, you may have gathered that there’s a lot of stuff going on in Frontera. Almost too much sometimes, where even though there is a central narrative where all of the characters and their individual storylines can pass through and congeal, there is a noticeable feeling that everything is just a bit underdeveloped. This is most observable in the case of Sean (Seth Adkins), the shooter who was manning the gun when Olivia died. When news of the murder breaks while he is in school, he runs to the bathroom and begins to break down in a stall. And until the film’s ending, that’s it for the character. It would have been interesting to have plot threads like this stretched out more. Similarly, some vital aspects of the coyote overtake of Paulina’s group suffer the fate of having to be mentioned in passing in the interest of creating a manageable runtime. But even the poor plotting can’t stop strong performances from spilling through. Michael Peña plays Miguel with a degree of quiet power. This is a recurring theme for the actor, which is similar to the showing he turned in earlier this year playing the title character in Cesar Chavez. Ed Harris’ talents aren’t stretched very far, but that doesn’t mean that he isn’t compelling as Roy, the retired lawman that still seeks the truth, especially when investigating his wife’s murder, examining what he believes to be the facts of the case, and whether or not they add up. He and Amy Madigan, of course, have been married in real life for over thirty years now, so the scenes at the start of the film where their characters are established are expectedly solid. And Eva Longoria’s Paulina is vulnerable, personal, and thoroughly driven. Aside from acting, the movie is also blessed with sharp, gorgeous cinematography from Joel Ransom, where wide shots of canyons and deserts are framed beautifully, as are intimate close-ups. Darren Tate and Kenneth Lampl’s score evokes many motifs from old westerns and classic melodramas – kinds of movies that Frontera wants to emulate, but never reaches. Frontera is by no means a bad movie – I just spent an entire paragraph discussing its strengths. However, it isn’t a very good one, either. The problem is that the script has too many components and doesn’t flesh them out. There are flat characters, and too many different things happening to fashion a complete and equally distributed story. And it hurts to say this, because this is a movie with the highest of intentions and the greatest of ambitions. Maybe it could be worth seeing with a group, because even though the movie is more focused on characters than politics, it could still probably trigger a solid discussion about immigration, but otherwise, it feels like much of Frontera’s good work has not been used to the fullest.